I had the chance to taste the refined Jamon ham in Lebanon, just before I am traveling to Madrid in a couple of weeks with MakeSense for the SenseCamp in Madrid! Bar Jamon is located in a cozy and friendly managed spaced, right next to A cote in Mar Mikhael. It offers a wide variety of Jamon, including Jamon Iberico, Jamon Lomo, Jamon Serrano, and Chorrizo. What I loved most about the place is that you can have a dessert from A cote, and I would advise the Cheesecake with a strawberry sorbet ice cream scoop. 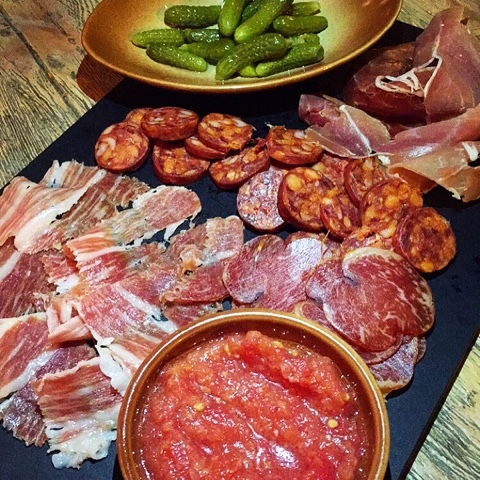 If you want to eat a bite, go out, and spend quality time with your friends or family, Bar Jamon is the perfect spot. You can sit inside at the bar or even choose to sit at A cote’s seating area. We ordered the Artichoke and Manchego Salad, the Gambas al Ajillo, the Sobrassada with goat cheese and honey, and una tabla de Jamon (Iberico, Lomo, Serrano, Chorrizo). We satisfied our sweet tooth with a Cheesecake from A Cote. There is also a selection of wine on the back of the menu. Loved the garlic and parsley seasoning with the shrimps. Smashed ground pork sausage on a toast with melted Goat Cheese. YUM! I think it is my favorite item of the menu. Artichoke and Manchego Cheese Salad. Not bad. I'm not a fan of cheesecake usually but I decided to give it a try, I loved it but I insist on the Strawberry sorbet ice cream scoop!